About us-TianJin Mainland Hydrogen Equipment Co., Ltd.
the process and equipment was granted the national invention patents, patent No. : ZL 95 1 16125.3, and identified as state-level new product in 1995 by the State Economic and Trade Commission. TIANJIN Mainland Hydrogen Equipment Company Ltd. (THE) established in 1994, has a registered capital of 30 million yuan. 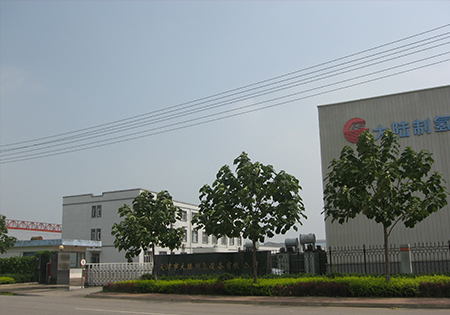 As a professional manufacturer of hydrogen generator and gas purification equipment, THE has a powerful technological team including the most famous experts in the field of hydrogen generation by water electrolysis and gas purification. The company has about 100 employees and 50% of them have senior professional titles. THE is the exclusive manufacturer of water electrolysis hydrogen generation equipment with separate flow process, the process and equipment was granted the national invention patents. THE can product 0.1Nm3/h～1000Nm3/h water electrolysis hydrogen generator and 2Nm3/h～1000Nm3/h gas purification unit, 5.0Mpa water electrolysis hydrogen generator is the highest operating pressure in the world. Main products: water electrolysis hydrogen generation unit, hydrogen purification unit, oxygen purification unit, nitrogen purification unit, PSA hydrogen generation unit, PSA nitrogen generation unit, PSA oxygen generation unit, hydrogen generation unit by methanol reforming, pure water hydrogen generator. The technological characteristics of hydrogen generator manufactured by THE have reached the international advanced level and some data are at the leading position. Ni-Mo-S Cathode was the innovation item funded by The Ministry of Science and Technology of P.R.C and The Ministry of Finance of P.R.C. THE can provide containerized hydrogen generator、skid mounted hydrogen generator, cabinet mounted hydrogen generator, SPE hydrogen generator to meet the requirements of different customers. THE has passed ISO9001:2000 quality assurance audit by NQA. Hydrogen generation equipment and gas purification equipment manufactured by THE have been widely used in the fields of electricity, electronics, semiconductor, optical fiber, metallurgy, chemical, atomic energy, float glass, oil and grease industry etc and have been exported to many countries, such as USA, Denmark, Iceland, Norway, Greece, Russia, Bulgaria, South Korea, north Korea, Egypt, Kuwait, UAE, Saudi Arabia, Indonesia, India, Philippines, Algeria, Pakistan, Burma, Iran, Syria, Tanzania, etc. THE’s policy: Excellent quality, timely supply, reasonable price, good service.